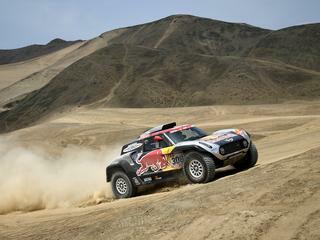 Motorbike driver Sam Sunderland has won the fifth stage of the Dakar Rally on Friday. The Briton was initially not the fastest, but the victory was later awarded by the jury. Sunderland had helped the crashed Portuguese Paulo Goncalves along the way and therefore spent a lot of time. The competition management gave him ten minutes back. The Frenchman Xavier de Soultrait, who was initially declared the winner, finished 3 minutes and 23 seconds second. The third place was for the Austrian Matthias Walkner, who gave 3.32. The American Ricky Brabec continues the lead with a lead of almost three minutes on the Chilean Pablo Quintanilla. The Dutch Wesley Pittens did not make it to the finish. The Yamaha of the Dutchman was too badly damaged by a crash. Pittens remained unharmed, but had to leave Dakar Rally.